Multi Step Form Wizard based on Html5, CSS3 and jQuery. It can be used for all type of web applications like custom admin panel, project management system, admin dashboard, application backend, CMS or CRM. Its lightweight and compatible with almost all major browsers and devices. 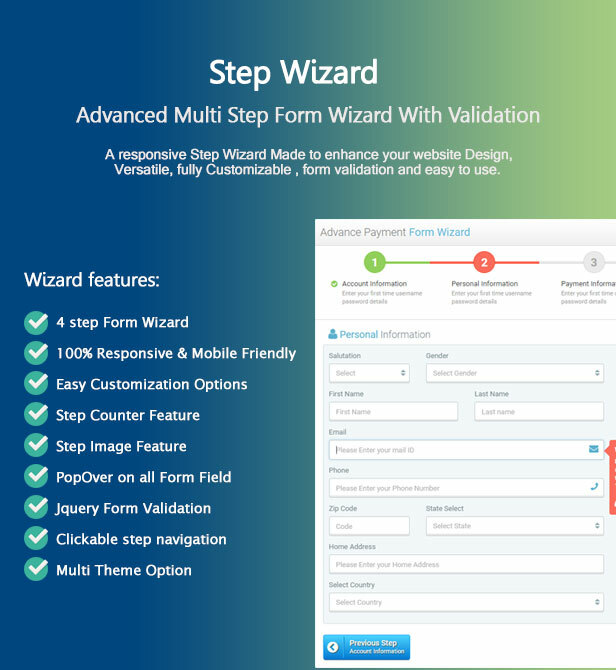 MultiStep Forms Wizard fully responsive on any device like phone, tablet and desktop. We have use animate.css for making animation on step wizard. we have provide full jQuery form validation inside plugin option. you can validate all field or specific field by using this plugin. Multi Step Form Wizard provide step Counter and step Image feature. You can set field description with popover . you can adapt step navigation clickable to your website’s requirements. All error message are configure inside plugin so you can quickly change error message when you have enable form validation.